The 20-year-old Hungarian claims his sixth ITF singles title. 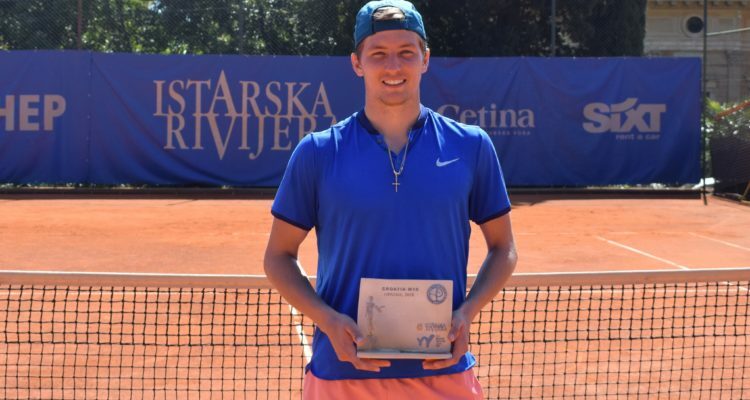 Mate Valkusz clinched the title of the $15,000 Istarska Rivijera Opatija, the final stop of the three-week clay-court swing in Istria. The top seed from Hungary defeated No. 8 seed Nernan Fatic of Bosnia and Herzegovina in Sunday’s singles final. Valkusz advanced to the title match with straight-set wins over compatriot Peter Nagy, Benjamin Pietri of France, Jeroen Vanneste from Belgium and Nik Razborsek of Slovenia. The World No. 320 in the ATP-Rankings broke Fatic’s serve five times to seal victory in one hour and 32 minutes. Valkusz, who celebrated his maiden ITF title here Croatia last year, lifted his sixth trophy, his first of the season. The 20-year-old collects $2,160 in prize money as well as 100 ITF Ranking points. “I dont know how many times I’ve got to comeback from injuries and health problems but this one felt great,” Valkusz posted on instagram. On Saturday, Ivan and Matej Sabanov took their third doubles title this year, following their two triumphs at the ITF World Tennis Tour M15 events in Antalya, Turkey. The top seeds from Croatia eased past Krstev Ondrej and Robin Stanek from the Czech Republic 6-1, 6-4. The encounter lasted only 53 minutes. This entry was posted in ITF Future Opatija, ITF World Tennis Tour and tagged ITF World Tennis Tour, Mate Valkusz, Opatija.